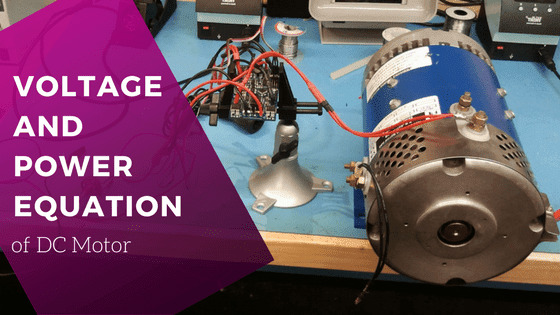 In this post, we will look at the voltage and power equation of a dc motor and the condition for maximum power in a dc motor. supply the armature ohmic drop IaRa . Hence, out of the armature input, some is wasted in I2R loss and the rest is converted into mechanical power within the armature. Obviously, the higher the value of Eb as compared to V, higher the motor efficiency. Thus maximum efficiency of a dc motor occurs when back EMF is equal to half the applied voltage. Thus gross mechanical power developed by a motor is maximum when back EMF is equal to half the applied voltage. This condition is, however, not realized in practice, because in that case current would be much beyond the normal current of the motor. Moreover, half the input would be wasted in the form of heat and taking other losses (mechanical and magnetic) into consideration, the motor efficiency will be well below 50 percent.